There’s plenty of things to do in Mazatlan for those not content to spend their entire visit on Mazatlan’s wonderful beaches. Three islands dot Mazatlan’s horizon: Isla de Pájaros, Isla de Venados, and Isla de los Lobos. Each has its own personality. Venado (deer) and Lobos (wolf) are quiet and undisturbed, perfect for water sports. Pájaros ("birds”) is popular for birdwatching. Hundreds of species nest on the island. Regular amphibian service departs throughout the day from the beach area in front of El Cid Resort and from other locations. Round trips cost about $8 US. per person. See over 50 fresh and saltwater tanks with sharks, eels, seahorses, lobsters, and over 250 exotic species from around the world. Interesting sea museum, a trained seal show and an auditorium with films about sea life make this a perfect things to do in Mazatlan activity. Open daily 9:30am–6pm. A tiny zoo and botanical gardens (el Jardín Botánico) are nearby. Tel. (69) 817815. Located at 407 Playa Gaviotas Street, in the heart of the Zona Dorada, sits this treasure trove of seashells. Upon entering, the place will seem more like a store than a museum. Find gorgeous seashell and silver jewelry, coconut art, windchimes, all the seashells you could hope to own. But whatever you do, don't miss their upstairs! Aquariums surround a large fountain and sea shell mosaics. Here you will find a vast display of all types of shells, and even some whale bones! Open daily from 9 a.m. to 7 p.m. If you're seeking Mazatlan attractions outside of the Zona Dorada, we suggest spending time in historic Viejo Mazatlan. A nice, central starting spot is the Plaza de la Revolucion at streets 21 de marzo and Benito Juarez. With a gazebo as its center, this small landscaped park is surrounded by merchant stalls offering food, cothes, soaps, jewelry, leather goods, and other handicrafts. There are also plenty of chairs to have a seat in if you need a good shoe shine. Or just have a seat on a bench and watch the pigeons bathe in two large fountains. Facing the Plaza de la Revolucion is Mazatlan’s beautiful Catedral de la Purisma Concepcion (Cathedral of the Immaculate Conception) open from 6:00 a.m.-1:00 p.m. and 4:00-8:00 pm. daily. Begun in 1856 and completed in 1899, this Moorish-style church has twin blue and gold spires and a gilded ornate triple altar. Just a few blocks from the cathedral is the Plazuela Machado located at Avenues Constitucion and Carnaval. Named for Juan Nepomuceno Machado who donated the land, this small park is also built around a gazebo. Beautiful flora set off the surrounding colonial buildings which are now home to many flavorful cafes. Just to the south of the Plazuela Machado is the famous Mazatlan attraction the Teatro Angela Peralta. 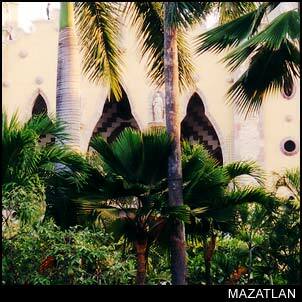 Almost anyone is Mazatlan will happily tell you her story. A famous opera singer, she came from Europe to share her talents with Mazatlan in 1883. Carried to her hotel by her Mexican fans, she sang from her balcony to a large crowd. Although she was scheduled to give a formal performane, she succumbed to yellow fever and died before the performance. The theater itself was completed around 1890, but a 1975 hurricane almost entirely destroyed its inside. Workers recovered most decorations and re-created the original design.Iit appears today almost exactly as it did in the 19th century. The theater continues to operate, hosting folkloric dance, opera, and symphonic performances. After taking in this famous Mazatlan attraction, go back to the Plazuela Machado and head west on Sixto Osuna Street. A few blocks down, on the right, you will find the National Institute of Anthropology and History or INAH. Altough smaller than would be expected, the museum is free and includes some intersting finds. While most of the descriptions of artifacts are in Spanish, there are a few explanations in English. Take in early Mexican pottery, sports equipment, figurines, and arrowheads. Perhaps most interesting is a display which contains human remains, including three skulls which illustrate the flattened foreheadss that were so fashionable centuries ago. A small courtyard in the back of the museum is home to a sparse metal scuplture garden. Nearby, at Angel Flores and Ninos Heroes Streets, is the Ben Franklin Library at Hidalgo Square. This small plaza, named for the father of Mexican independence, Miguel Hidalgo, was the original sight of Mazatlan's market. As the area was gentrified and property prices rose, the market was moved to its present sight a few blocks away. The library, which houses an extensive collection of Spanish texts as well as study tables and a children's area, is open Monday through Friday from 8 a.m. to 9 p.m. and Saturdays 9 a.m. to 2 p.m.
No visit to Mazatlan is complete without a visit to the bustling mercado central, now located at Juarez and Ocampo Streets. This indoor/outdoor marketplace is one square block of stalls offering clothing, jewelry, produce, meats, and more. As this is where the locals shop, be sure to bargain with the vendors. If you don't find what you are looking for at the mercado, there are plenty of stores on the surrounding blocks to satisfy all your shopping needs.